Photograph of the patient’s face shows bilateral periorbital ecchymosis (raccoon eye appearance). 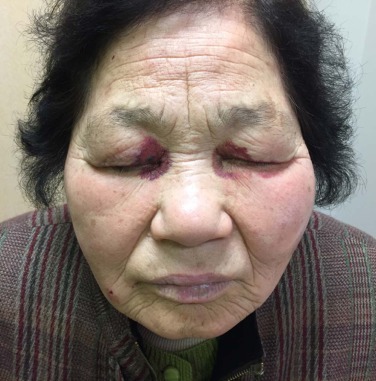 An 82-year-old woman presented to our outpatient clinic with a 6-month history of recurrent internal bleeding near the eyes. The patient had a history of type 2 diabetes mellitus, but had no significant medical history including traumatic injuries. Physical examination revealed bilateral periorbital ecchymosis and large tongue (Figure). Serum protein electrophoresis revealed an M-peak in the gamma fraction, and urine immunofixation electrophoresis was positive for Bence-Jones protein. In addition, amyloid fibrils were detected in biopsy of abdominal subcutaneous fat tissue. On the basis of the clinical and immunohistological findings, we made a diagnosis of amyloid light-chain amyloidosis. Amyloid light-chain amyloidosis is a rare, multisystem disease characterized by the deposition of amyloid in various organs and extracellular tissue, including the kidney, heart, liver, digestive tract, spleen, and autonomic nervous system.1 However, symptoms in the early stage vary widely and include weakness, epigastric discomfort, weight loss, and poor appetite. These symptoms are often vague and nonspecific, and can be confused with other disorders. The gradual amyloid deposition results in damage and affected function in the organs and tissues, and the other symptoms in the most commonly affected organs and tissues include nephrotic-range proteinuria, congestive cardiomyopathy, macroglossia, hematemesis, hematochezia, and autonomic or sensory neuropathy. Untreated amyloidosis has progressive, irreversible consequences and can ultimately result in death. Thus, an early and precise diagnosis of amyloid light-chain amyloidosis is essential in order to prevent further organ damage. Therefore, when the raccoon eye appearance is present, clinicians should consider amyloidosis as a possible differential diagnosis. Are We Over-Prescribing Medications to Patients in the Last Year of Life? In a retrospective study of prescribing patterns for patients in their last year of life, researchers found that patients are often taking 10 or more medications toward the end of their lives. Many of these medications are preventive agents that take years to work. Read the Research: “Choosing Wisely? Measuring the Burden of Medications in Older Adults Near the End of Life: Nationwide, Longitudinal Cohort Study” by Morin et al in the August 2017 issue of the American Journal of Medicine.